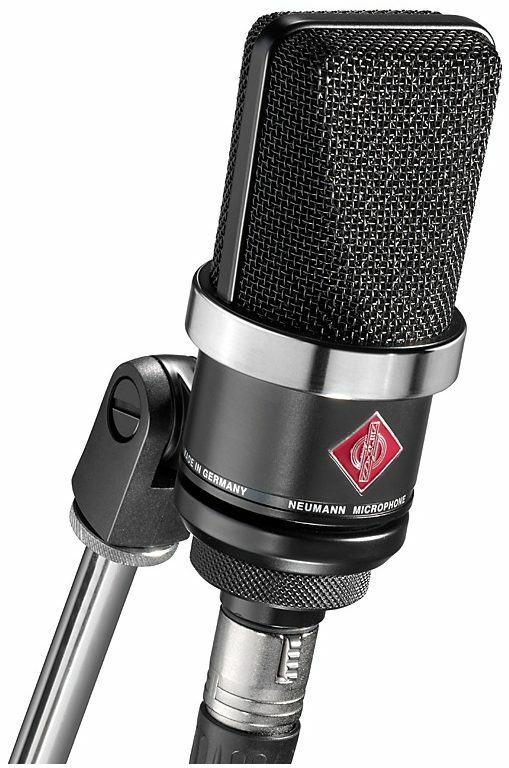 Bring Home Neumann Sound for an Amazing Price! Despite its small size, the Neumann TLM102 studio microphone is well-equipped to make myriad sound sources -- from vocals and voiceovers to drums and amps -- sound huge. Ideal for home recording, broadcasting, and project studio applications, this diminutive Neumann microphone is a multi-functional must-have for anyone on a tight budget. If you treat it right, the large-diaphragm TLM102 will be your go-to studio mic for many years to come. With its fixed-cardioid large-diaphragm capsule's maximum sound pressure level (SPL) of 144 dB, the TLM102 can capture the fine details of drums and other very loud sound sources. When it's time to settle down and record something quieter, like vocals, the TLM102 really shines thanks to a slight boost above 6 kHz, which helps vocals stand out in a mix. According to Neumann, up to 6 kHz, the frequency response is extremely linear, making this microphone a standout choice for getting great recordings with a clearly defined bass range and minimal coloration. The expense of the TLM102 microphone is quite fair when you consider its wide range of applications. This one mic can yield exceptional results when recording loud instruments like drums and amps, for example, as well as quieter sound sources like the acoustic guitar and the human voice. If you've got a restricted allowance for recording gear and you have a small studio space, investing in a multi-purpose microphone like the Neumann TLM102, instead of a bunch of different microphones dedicated to specific recording applications, makes sense. The classic look of the TLM102, with its small-scale yet signature Neumann design and shiny grille ring, makes this fixed-cardioid condenser mic look more expensive than it is. More than just a nice embellishment, the grille ring features an integrated pop screen that suppress plosives in vocal and speech recording. The capsule serves another purpose as well, with an elastic suspension designed to suppress structure-borne noise. The TLM 102 is impressive in terms of sound: In the interior is a large-diaphragm capsule (cardioid) with a maximum sound pressure level of 144 dB, which permits the recording of percussion, drums, amps and other very loud sound sources, for example. Instruments that are not especially loud also benefit from the very fast transient response of the TLM 102. However its most important applications are in the realm of vocals and speech; a slight boost above 6 kHz provides for excellent presence of the voice in the overall mix. Up to 6 kHz the frequency response is extremely linear, ensuring minimal coloration and a clearly defined bass range. The capsule has an elastic suspension for the suppression of structure-borne noise. A pop screen integrated into the grille serves to suppress plosives in vocal and speech recording. *The design of the microphone is a registered design of the Georg Neumann GmbH in certain countries. Overall: Yeah, so what, it's small. Don't let that fool you. The sound I get from this little guy is HUGE. I have several respectable mics, and this little fellow certainly holds it's own. This will be my go to for years to come. Do yourself a favor though, don't buy a mic of this quality until you have a great preamp to go along with it. I'm afraid that with a cheap preamp your just not going to properly hear what this mic can archive. Overall: Seeing the pictures online made me think one thing. But then seeing in my hand made me think another. This is a rather small microphone in comparison to what I've used in the past. Transitioning from a monsterous Sterling Audio ST-79 to the TLM-102 made a HUGE difference. The depth of the vocal is outstanding. The frequency range is great and the Higher SPL makes it able to withstand some of the loudmouth vocalist rappers it will be used on. I myself have a deeper raspier voice and this mic works wonders on the clarity of it. In the mix there is much more control on dialing in to get the sound you want. This little Big Dog is now my Go to mic for Vocals out of my collection which includes: a. (1) ST-79 -Sterling Audio - Condenser b. (1) ST-55 - Sterling Audio - Condenser c. (1) MXL 990 and (1) 991 - MXL - Condensers d. (2) Fathead I - Cascade - Ribbon e. (1) TLM-102 - Neumann - Condenser (these are just my Vocal specific mics) All in all I love the mic and the mixing flexablity, its smaller size, and its versatility in use. Sure there is not a bass roll-off, or pad switch so it may not be best for SOME RANDOM VERY SPECIFIC NEED. But for the typical use of a microphone this thing has become my best friend.